Crows can be found almost everywhere that people are, from tropical islands to deserts and arctic forests, from densely populated cities to suburbs and farms. Across these diverse landscapes, many species of crows are doing very well today: their intelligent and adaptive ways of life have allowed them to thrive amid human-driven transformations. Indeed, crows are frequently disliked for their success, seen as pests, threats, and scavengers on the detritus of human life. But among the vast variety of crows, there are also critically endangered species that are barely hanging on to existence, some of them subjects of passionate conservation efforts. The Wake of Crows is an exploration of the entangled lives of humans and crows. Focusing on five key sites, Thom van Dooren asks how we might live well with crows in a changing world. He explores contemporary possibilities for shared life emerging in the context of ongoing processes of globalization, colonization, urbanization, and climate change. Moving between these diverse contexts, this book tells stories of extermination and extinction, alongside fragile efforts to better understand and make room for one another. Grounded in the careful work of paying attention to some very particular crows and their people, The Wake of Crows is an effort to imagine and put into practice a multispecies ethics. 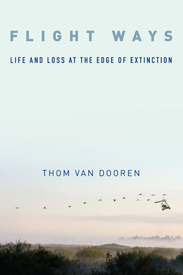 In so doing, van Dooren explores some of the possibilities that still exist for living and dying well on this damaged planet. ~ John M. Marzluff, Professor of Wildlife Science, University of Washington and author of Gifts of the Crow and Welcome to Subirdia.